Merlin #5188 - Yankee Golden Retriever Rescue, Inc.
Merlin was 8 when his family could no longer keep him. Merlin had been with them since he was a puppy and was a true member of his family. Sadly, two family members suffered from severe allergies. After ignoring their doctor’s advice in an effort to keep Merlin, they finally had no choice but to find him a new home. After much discussion, they decided that YGRR would be able to find Merlin the type of home they wanted for him. Merlin went directly to one of our vet hospitals and was given a complete checkup. He had one eye that was cloudy, which his family was monitoring. We brought him to a veterinary ophthalmologist to make sure we had the most complete information before he was adopted. The ophthalmologist diagnosed him with a hereditary condition called pigmentary uveitis. Merlin no longer had vision in the affected eye, and since this condition can become painful over time, we decided to remove the eye. Since he had no vision on that side anyway, he had no trouble adjusting after the operation. He was also prescribed medication to help him keep his vision for as long as possible in his other eye. Merlin was a fun, affectionate, and obedient boy. 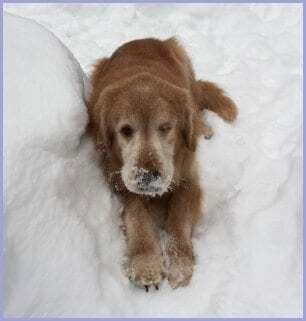 He would lean against you like a cat, and he loved to play ball outside in the snow. He quickly became a favorite, and we knew he needed a very special home. Luckily, we knew just the family to meet him! Merlin now loves his new life and new family. He gets all the attention a Golden could ever want. He enjoys playing ball in his fenced yard, and his new neighbors even bring him toys! Merlin’s new family reports that he listens well and is eager to please. They have continued to shower Merlin with the affection he is used to, and they have tried to incorporate his favorite things into their life with him. Merlin loves peanut butter, frozen bananas, and he also got very excited when they made popcorn for the first time! He also gets to watch Animal Planet. Outside, he loved playing ball in the snow and having paths around the yard shoveled for him. Unlike most humans, Merlin is going to miss running through the snow, grabbing mouthfuls of it as he goes. However, with the melting snow Merlin is finding new things to explore, and he has substituted snowballs for sticks. Merlin’s adopters will continue to monitor his eye and he already has his next ophthalmology appointment scheduled. If he eventually loses vision in this eye, his adopters have researched how to make life as easy as possible for him. Luckily, dogs don’t feel sorry for themselves and adjust very well to such changes. Merlin is very attentive to his new family and is very attached to them. His adopters love him and feel very lucky to have been chosen to be Merlin’s new family! Merlin thanks you for your support. Merlin was given the same TLC and care we would give our own dogs, and in fact all the Rescue dogs are considered our dogs while they are with us and even after they are adopted. We take great care to choose the right home for each dog, one that is able to take care of any medical needs and that has the right environment where each dog will thrive. This is all possible thanks to your support. Merlin and all the Rescue dogs thank you and send big wags and kisses your way!